An improvement in abrasion resistance, durability and mileage: this is what the new Port Plus compound from Continental has to offer. During the TOC Europe event, Continental will be showing the new compound for its V.ply portfolio and the digital tyre pressure monitoring systems ContiPressureCheck and ContiConnect. TOC Europe takes place from June 12 - 14 in Rotterdam. Visitors will find Continental Commercial Specialty Tyres (CST) at booth C26 in Rotterdam Ahoy, Hall 1. Ever bigger, ever taller, ever faster: Empty container handlers and reach stackers are responsible for loading and unloading containers. In this typical pick and stack application, the lift trucks twist and turn on the spot, the tyre heats up very quickly and tyre wear increases. Cracks and bulges in the tyre are not uncommon. 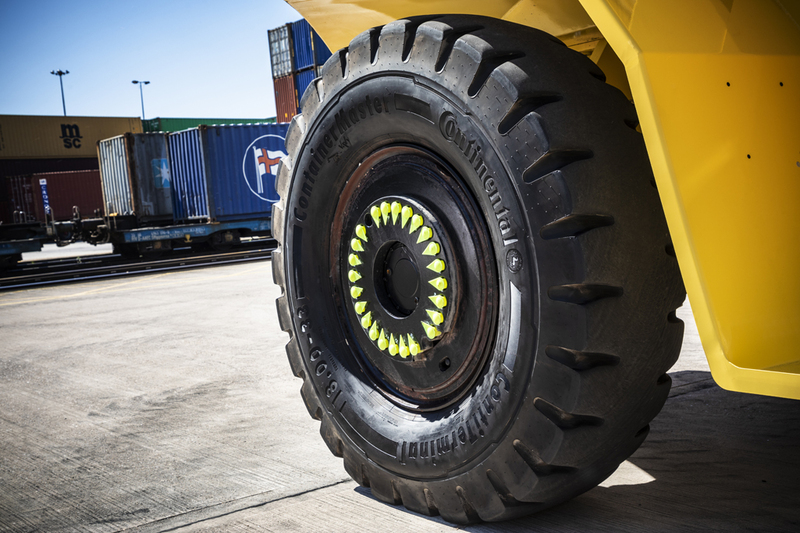 Continental's new Port Plus compound reduces tyre heat generation, minimises wear and extends tyre life significantly. “We have been running tests at our customers over the last year and have seen cases where the tyre life was even doubled”, says Julian Alexander, Product Line Manager Material Handling at Continental CST. Safety and efficiency are the key success factors in the port business. However, tyres with low air pressure are still a common cause of breakdowns. To ensure the correct pressure and tyre temperature, Continental has developed the digital tyre pressure monitoring systems ContiPressureCheck for individual vehicles and ContiConnect for fleets. Continental tyre sensors are at the core of both systems. The intelligent sensors constantly measure temperature and pressure from inside the tyre and provide data to be displayed on a device – whether this is on a handheld tool, inside the driver’s cabin or on a web portal overseeing the fleet. The alerts and notifications are designed to steer the fleet operator’s attention to tyres in need of immediate action.